Girls, why aren’t you happier? It’s a question that is being asked increasingly by economists who, in research dating back to the 1970s, have detected a turnaround in almost all female measures of happiness or life satisfaction. I’ll get to the issue of why happiness matters in a second, but it seems from just about every measure that women — historically the much happier of the sexes — have shown a substantial decline in overall happiness, and there has been a closing of the gap between males and females. A couple of the leading researchers in this field, Justin Wolfers and Betsey Stevenson, were at a conference on the economics of happiness last week and went through much of the literature surrounding this issue. 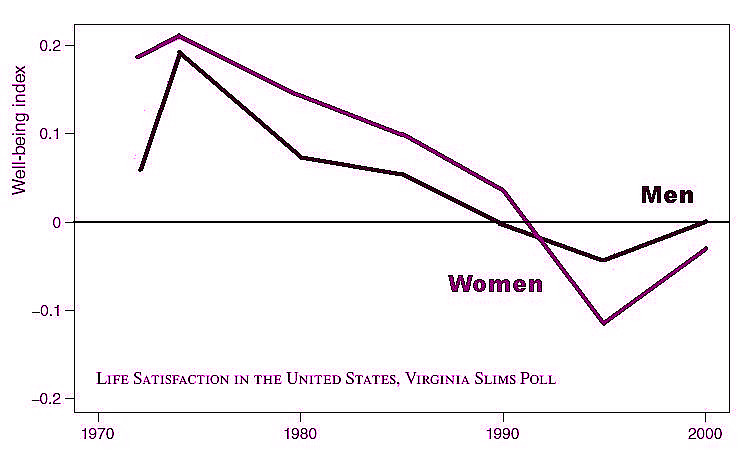 Back in the early 1970s there was a sizeable gap between men and women on all questions of happiness. 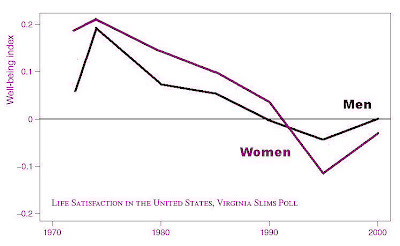 American women were, in general, much happier than blokes. This type of finding was not just found in “official” opinion polls. Cigarette maker Virginia Slims, carrying out its own market research, had similar results as did a long-term study of students just about to finish high school. All confirm that over time the gender happiness gap has disappeared. It wasn’t necessarily that men got happier (although there appears to have been a slight fall in those saying they were not too happy), but there has been a sizeable fall in the number of women saying they were satisfied with their lot. Now of course the 1970s marked the kicking-off of equality for women in the workforce. There were also massive social changes (think of divorce law, wider availability of cheap and safe birth control) that seemingly gave women much more. There are some pundits, notably on the Right in the US, who reckon that this fall in happiness shows the women’s lib movement was a failure. Except that ignores that this has been a fall in happiness across all but one strata of women. Those less happy are married and single women, women in work and those at home, girls aged 17, those with and without children. But black women have got happier. Indeed, their happiness levels have risen even faster than black men. This may have something to do with the other great social change — the American civil rights movement. Now it would be easy to say this is an American phenomenon. But similar studies of happiness and satisfaction across Europe have found a similar change. Although the fall in female happiness has not been as great, the gap between men and women has all but disappeared. And, given the wide changes in culture across Europe, this declining level of overall happiness is just as evident in Denmark as it is in Greece. Unfortunately, the same research has not been done in Australia, but it would be a mighty effort for women of the Antipodes not to be as glum as their northern hemisphere counterparts. And this is a particular issue. By any measure, the lot of women has improved over the past 40 years — from education to wages to absolute freedom in any aspect of their lives. Professor Wolfers and others aren’t sure what’s behind the disappearing happiness gap. He says the study of US schoolchildren shows girls have increased concerns about the amount of time they have to do things (spend time with friends, for instance). But has there been a sudden change between young American females and their male counterparts over the period? It’s an issue for politicians and policy makers who aim to maximise economic growth. If getting richer doesn’t make us happy, then there’s something wrong. But it’s also a problem for those now trying to argue that instead of GDP we should try to maximise other aspects of our lives. However, as these studies show, if we don’t know why women are getting less happy, then any policy response would be effectively shooting in the dark. Another idea is that as women have become more financially free, they’ve come to realise that finances are not that fun. However, that would suggest women at home looking after children (the poster family of the 1950s) should be at least as happy as they were. But they’re not. 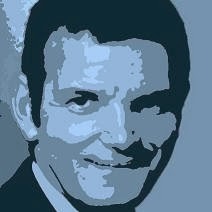 Ultimately, trying to help people have a more satisfying, happier life should be the aim of all policy makers. Indeed, the happiness policy area was part of the underpinning of the great cash splashes of last year and this year (based partly on the idea that happier people are more confident, and that confidence is a key part of the economy’s operation). Despite the complaints of the stimulus snobs, it proved to be one of, if not the, best policy responses to the global recession of the past 12 months in any country. Happiness really does matter, not just in our relationships, in our workplaces, in our families — it matters to the overall economy. Now, just to find what it is eroding the happiness of the world’s women.